At the end of a long, cold day, there is nothing better than cuddling up in a warm, comfortable home. Brian's Refrigeration has a broad selection of high-efficiency Luxaire furnaces that will keep you warm all winter long. Our top quality products are dependable and reliable. We have the utmost confidence in the furnaces that we install, and our warranty reflects that. You just cannot find a better combination than Luxaire products and our expert team of installers. 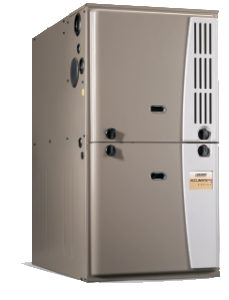 Acclimate™ Series gas furnaces are ENERGY STAR® qualified models that offer at least 15% to 25% higher energy efficiency than standard models — plus the innovative GeoTrak™ Comfort System creates an operating cycle that works best for your locale. LX Series furnaces fit your needs with select ENERGY STAR® models that reduce your utility bills. Count on the high efficiency of Climasure™ Series gas furnaces to keep you warm in the coldest weather. A 90% plus furnace has two heat exchangers (a primary and a secondary) and are commonly called “condensing” furnaces. These furnaces are capable of extracting at least 92% of the heat from combustion and transferring it into your home. The term “90% plus” means just that, the furnace’s efficiency rating is above 90%. For each $1.00 of natural gas that the furnace uses, at least 92% (or $.92) is used to actually heat your home and the remaining 8% (or $.08) is vented to the outside through the sidewall or roof of your home using a PVC plastic pipe. An 80% efficiency furnace has only one (or primary) heat exchanger and extracts at least 80% of the energy from the combustion process and transferring it into your home. Simply stated, for each $1.00 of natural gas or propane that is used by the furnace, at least 80% (or $.80) is actually used to heat your home. The remaining 20% (or $.20) is vented out through your chimney or flue pipe. Modulating gas furnaces are very high efficiency furnaces, usually 95% and higher. These models also use computer technology along with special gas valves to control the burner output. The burner levels on these models operate at varying levels hence the term “modulating”. When the room thermostat calls for heat, the furnace fires and starts operating at a “medium” level. The furnace operates at this level for a short period and as the temperature gets closer to the set point, the furnace “modulates” to the lowest level until the thermostat is satisfied. In cases where the thermostat is set significantly higher than the room temperature or the heat demand is high, the furnace will operate on the highest stage in order to warm the home up as fast as possible. 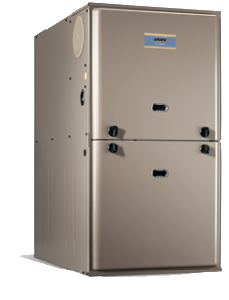 Two-stage gas furnaces are available in both 80% and 90% efficiencies. However, two-stage furnaces use a microprocessor along with a two-stage gas valve to control the burners at a high or low rate, depending on the heat demand. When the outside temperatures are moderate, the burners operate at a lower, more efficient rate. If the outside temperatures are very cold, then the furnace will operate at the higher rate in order to keep up with the heating demand. Single-stage gas furnaces are available in both 80% and 90% efficiencies. The term “single-stage” means simply that the furnace’s burners fire at one fixed heating level. When the thermostat tells the furnace to heat, the gas valve opens and the burner flame ignites. When the thermostat is satisfied, the burners shut-off. This season, that home comfort system you’ve been wishing for is now within reach. You’ll feel comfortable in so many ways from ideal indoor temperatures and lower utility bills thanks to our ENERGY STAR®-qualified Luxaire home comfort systems. And with part of your purchase supporting our sponsorship of the Make-A-Wish Foundation, we’ll deliver more than just the comfort you’ve been wishing for. So end your wishing and call us today!